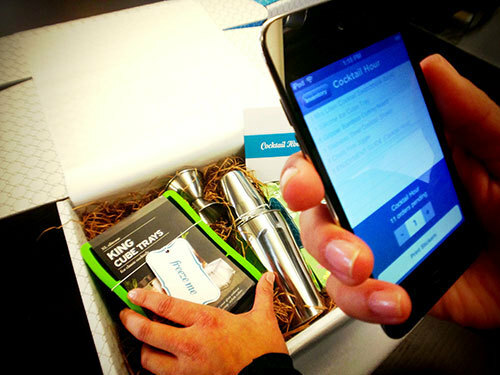 Introducing Rocket: the app that helps our team ship beautiful Sesame gifts. The objectives of Rocket are simple: provide a list of orders that need to go out, print shipping labels for those orders, enforce accuracy throughout the process, and track everything. And of course, avoid any bobcats from ending up in our boxes. And who says internal apps can’t have a little fun first? Maybe it was because we started specing Rocket the week of the successful SpaceX launch, but first time users of the app are greeted by an animation of a rocket ship with smoke trailing taking off with Elton John’s “Rocket Man” playing in the background. If you think it’s a bit much, I’ll agree with you only when I stop smiling every time I hear a new user open the app. A user is given two possible activities: Packing or Shipping. Because we have a limited number of gift sets and a relatively complex packing process, we chose to keep these two processes decoupled for operational efficiency. Gift boxes are packed from inventory and placed in a staging area; when orders come in, packed boxes are pulled from staging, sealed with a personal card from the sender, and shipped. 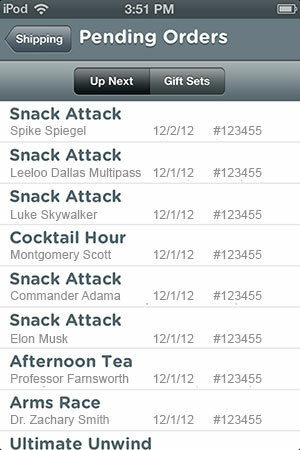 A user who selects Packing will see a list of gift sets sorted by priority (sorted by available box vs pending orders). Choosing a box type shows a list of items to grab from inventory. The user enters how many boxes they want to pack and clicks Print, which prints a unique QR code inventory control label for each box. 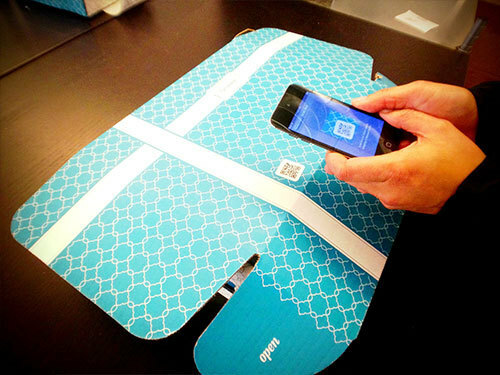 The packer affixes the QR code labels to the packed boxes, places them in the staging area, and moves onto the next box. Rocket talks to our server via an API, which lets us keep track of things like how many boxes have been packed and are ready for fulfillment, as well as who packed each one and when. If the user chooses Shipping, they see a list of pending orders as they come in, sorted by priority. Selecting an order from the top of the list, they see a screen that tells them what box type to grab from staging, and asks them to scan the QR code on the box with the camera. This step is important, because it essentially “checks in” the box to the order: the QR code ties the box to a specific id in our database, so we know that the scanned box matches what was ordered (in case it was accidentally placed on the wrong shelf), and we know who packed the box and when. So if Joe Customer writes me a week later telling me that someone took a bite out of one of the chocolate truffles in his Ultimate Unwind box, I’ll know that Jane Packer has a sweet tooth. Provided everything matches, the shipping label and the personalized greeting card are immediately printed at their shipping station. All the shipper needs to do is insert the card inside the box, seal it, and place the shipping label on the outside. An email is then dispatched to the customer, informing them that their order is on the way, along with their UPS tracking number. 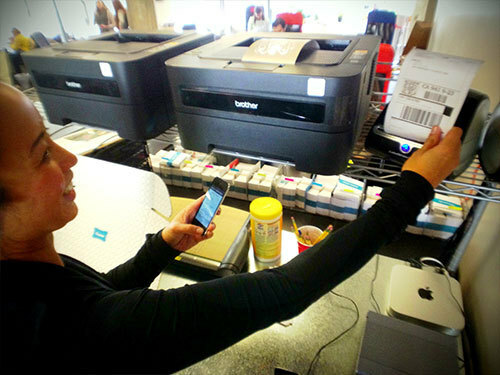 You may be wondering how we print labels and PDF greeting cards from the phone when the shipper clicks print. Actually, Rocket hits the server API, which then sends a request to the local CUPS server at the shipping station to print the label and card. But that’s all gravy - the important bit is that our packers and shippers don’t have to worry about marking orders as shipped, reconciling inventory, matching greeting cards with orders, or printing labels on their own - it all just works with timing synchronized to their workflow. Launching Sesame and developing Rocket was a fun technical and operational challenge for the team here. It was a great mix of app building, api hacking, and interfacing with the real world. We’ve only just begun using Rocket, but it’s already helping us keep up with the rapid growth of our new product. As we expand our operations, we expect Rocket to be a hidden ingredient of our special sauce.